art by michael perchard: " MFA-Pizza-Boston Celtics-Guest Artist Nicole"
" MFA-Pizza-Boston Celtics-Guest Artist Nicole"
Back At The MFA and Loving it! 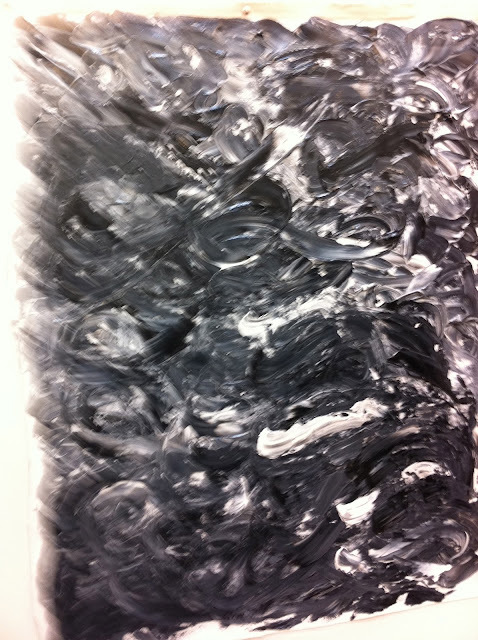 I am very happy to be taking the second part of my acrylic class at the Museum Of Fine Arts in Boston! I ended the day at the "Boston Garden" watching the Boston Celtics basketball team play against the Miami Heat! Can't get much better than that! I was very happy to reconnected with my wonderful art teacher Ria, and my newest great art buddy Nicole! The last photo in this post is one of Nicole's latest fantastic creations! "My Childhood Church, The Church Of The Most Holy Redeemer"
Acrylic Canvas 24" x 36"
The Most Holy Redeemer church is the oldest Catholic church in East Boston! A beautiful building with many beautiful childhood memories. Let's see where this painting takes me. 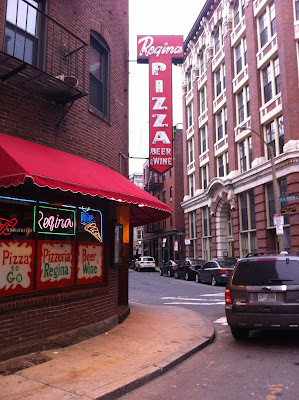 Pizza Regina in Boston's Historic North End! 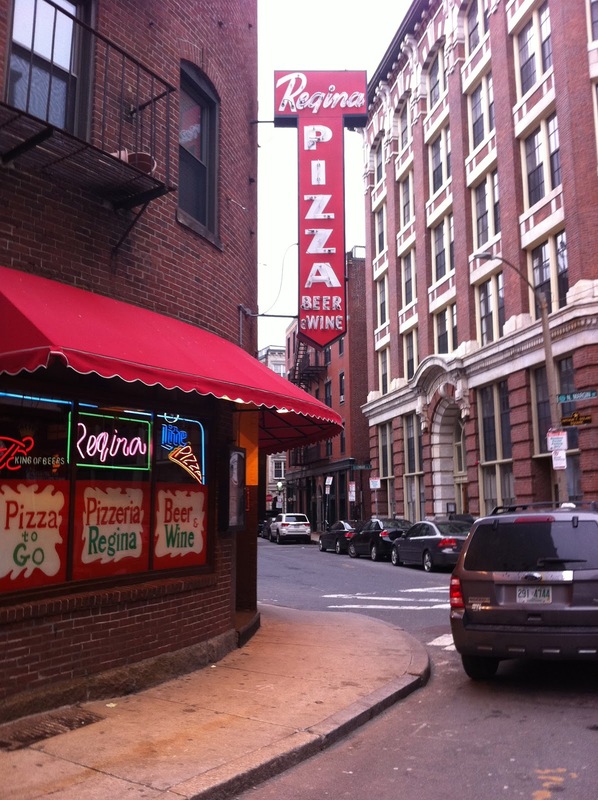 Probably the best pizza on the planet. Seeing The Boston Celtics play basketball at the "Garden" has to be one of the best experiences ever! I love Boston and anything Boston! Guest artist and one of my best art buddies, Nicole, started this wonderful piece in class! She said she is not finished yet. It certainly is looking fantastic! Hard to know when a great work is ever finished! Good luck Nicole! Thank you for visiting my blog. Please help make my day and leave a comment! Painting, pizza, Celtics, and snow....that's quite a day!!! Can't wait to see what you do with this! It was one of the best days! Let's hope all the days are the best ones! I will continue the work this week! back in class. I left the piece at the museum. Nest time I will take the work home to continue. Odd not to have it nearby to paint! Vous m'avez entraînée jusque là !!... Je m'aperçois que vous avez passé une excellente journée. Les petits bonheurs de la vie... accompagnés de belles peintures. Qui a gagné ? sourire ! You are right about the pleasures of life! Live every day to the fullest! My team, The Boston Celtics, lost. With only two seconds to go they had a chance to win but alas it wasn't meant to be! But the game was exciting. Such a great game. All were winners! Great start with your painting. And it sounds as though you're having a wonderful time in Boston... I'm envious! Thanks for dropping by! Always great to hear from you! I am having so much fun! I plan on finishing the work this week! I may do it in a Monet Style? I never know for sure! Pizza! Basketball! Paintings! Church! this is an epic post! Thank you so very much for writing! You are right about the epic post! Thank you! Epic day equals epic post! Thank you so much. I love your comment! bella la chiesa in questo stile colorato e molto creativo! E bello anche il lavoro non ancora finito che assomiglia a una catena di montagne infinita e dove può spaziare la fantasia! Mi piace il tuo lavoro e apprezzo molto anche i tuoi commenti davvero simpatici! Ciao my dear friend Floriana! Grazie! This church has a very special place in my heart. I am hoping when I am finished my love for this building shows in my heart! Wonderful post, Michael! I look forward to seeing your Acrylic finished....and the photos are wonderful..Pizza Regina looks like the perfect reference picture for a future painting as well!!! You are right! Pizza Regina should be my next painting! I am happy you liked my post! What a great day out Michael! I like the start you have made on your painting. Love seeing the photos of Boston and your guest artist's work. P.S. We also pronounce garden - "gahden"
Now I love Australia even more! We Bostonians are always teased about our accent! Pahk the cah in Hahvahd Yahd! Park the car in Harvard Yard! ☓ Celtics, aaah this is a problem... I am a Lakers fan. Hello My Wonderful Laker Fan Art Buddy David! Your comment made my day! I am still laughing and smiling! I love all the symbols and appreciate all the work involved! I miss the "Old" Laker and Celtic rivalry! Magic Johnson and Larry Bird! Wow! Much fun! Art on my friend and thanks! Yes, that was certainly one of the best rivalry's in all of sports. Back and forth over a decade or so. I do forgive ya for bein' a Celtic fan, kiddin' ya of course LOL ; ) ! Besides paint is thicker than sports alliances... right? You sound so downright happy, Michael! And your happiness truly brings a smile to my face! So very, very good to hear from you! I am happy! I make an effort to enjoy every second on the planet! I am so glad my little post made you smile! How wonderful and so very cool is that! We are still having snow in my neck of the woods and I think I am one of the very few who enjoys it! We artists can be a strange breed! I love your work Susan and now I must rush to see your latest blog to enjoy! Keep smiling and making great art Susan! The New England Coast U.S.A. I very much enjoy art and making art. I hope my art "speaks for itself" and I hope it "says" great things. Thank you for visiting my blog. Please leave a comment. Some Of My Favorite Artists! All work posted on this blog are copyrighted by the artist, Michael Perchard. "Magnificent Ocean" "My Studio" "Awesome Prism Diversion"
"Happy Patriots' Day USA!" Some MFA Art Work! "The Phoenix Farm House" Acrylic Canvas 10" x 14"
"Some Art And Some Snow!" Love the snow but didn't want to wait for Spring! I so love plein air painting! "Finished Trolley" Acrylic Canvas 24" x 30"